Think your tech is cool? Wait until you see what Umit Ogras is working on. Flexible hybrid electronics can be bent or stretched. Picture pulling a wand from your pocket, unfurling a scroll, and watching a movie on a desktop-size screen. Watching TV at home? Wave your arm and change channels. In the hospital? A disposable patch on your arm will use wireless connections to transmit data about blood pressure, heart rates and other vital signs to doctors and nurses. Wear a Fitbit watch when you go for a jog? That’s going to disappear into your sleeve, and it’s going to have scores more functions. Ogras, an assistant professor in the School of Electrical, Computer and Energy Engineering in the Ira A. Fulton Schools of Engineering, recently won a five-year, $500,000 early-career development grant from the National Science Foundation to continue developing flexible hybrid electronics. Computers have gone from room-size in the 1950s to desktops in the 1980s to handhelds today. Ogras’ research takes them into the next realm. “The smartphone can disappear if we wear it in our clothes,” he said. Health, motion and gesture monitoring will revolutionize personal devices. Ogras envisions mute people wearing a glove that will interpret sign language and literally “voice” communication. Wheelchairs will be controlled by arm motion instead of a joystick. Maps and GPS can be incorporated into devices. “It knows your location in the house and where you want to go,” Ogras said. Three of the biggest problems Ogras is working to crack are the cost, size and battery. His electronics use photovoltaic cells instead of batteries. The solar panels charge a small flexible battery during the day, which powers the electronics at night. The battery is 200 times less powerful than the battery in a typical smartphone. (It’s also 50 times lighter than a typical smartphone battery.) Energy harvesting is crucial. Ogras has been working on the research for three years. He worked at Intel Corporation on smartphones — systems running on chips. His devices will run systems on polymer. “We hope other people will start working in this domain,” he said. The NSF Faculty Early Career Development (CAREER) Program offers awards in support of early-career faculty who have the potential to serve as academic role models in research and education and to lead advances in the mission of their department or organization. Fourteen ASU faculty won the award this year. Typically the NSF funds about 350 CAREER faculty each year. David Grau has been named the Construction Industry Institute’s 2017 Outstanding Instructor and Outstanding Researcher. Grau came to ASU in 2013 with more than a decade of industry experience in design and construction coordination, along with experience in industrial, systems and computer engineering. 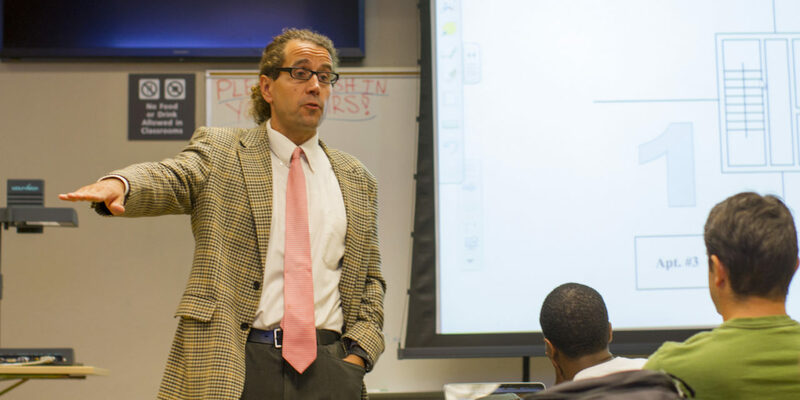 Those qualifications “make him unique in the field of construction engineering and enable him to develop and implement innovative and particularly effective instruction strategies,” wrote Professor G. Edward Gibson Jr. in nominating Grau for the CII teaching award. Grau teaches in the Del E. Webb School of Construction, a part of the School of Sustainable Engineering and the Built Environment, for which Gibson is the director. It is one of the six Fulton Schools of Engineering. He is also on the faculty of ASU’s Barrett, the Honors College and is a senior sustainability scientist with ASU’s Julie Ann Wrigley Global Institute of Sustainability. Grau teaches a variety of undergraduate and graduate courses, including Building Construction Methods, Materials and Equipment, Construction Productivity, Construction Industry Best Practices and Research Methods. Gibson points out that Grau has developed all of the materials and teaching strategies for the Construction Productivity course, using information from CII publications and teaching tools from two CII research teams. Through that course Grau is also introducing students to the industry’s evolving concept of “constructability,” which focuses on the importance of incorporating construction expertise into the early design stages of construction projects. “Students learn what constructability is, and what the benefits from its effective implementation are,” Gibson wrote. Outside of the classroom, Grau is the faculty adviser to the ASU student chapter of Engineers Without Borders, which aids disadvantaged communities through engineering projects, and he mentors students who are embarking on their first forays into research through the Fulton Undergraduate Research Initiative. Grau is also making an impact with his research efforts. He is “at the forefront” of applying computer and systems engineering to civil and construction engineering practices, according to Gibson. He notes that Grau is particularly well known for envisioning and implementing advanced radio-frequency identification tracking systems being used by construction organizations throughout much of the world. The CII is recognizing him with its Outstanding Researcher award for his achievement as the principal investigator on the project “Improving the Accuracy and Timeliness of Project Outcome Predictions,” conducted in 2013. That effort, according to the CII’s award judges, has since proven to have successfully identified that barriers to making accurate predictions relating to costs, management, scheduling and performance of construction projects stem mostly from “organizational behavior factors” rather than from faulty forecasting algorithms and numerical methods. Grau was nominated for the researcher award by Professor Edward Back, head of the University of Alabama’s Department of Civil, Construction and Environmental Engineering. He emphasized that the research resulted in the development of two tools — a Predictability Index and a “Four-Casting” assessment of the construction management process — that ensure more accurate project predictions through proactive rather than reactive forecasting and assessment practices. The CII is a nonprofit consortium of more than 130 leading owner, engineering-contractor and supplier firms from both the public and private sectors. Grau will be formally presented the Outstanding Instructor and Outstanding Researcher awards on Aug. 1 at the CII Annual Conference in Orlando, Florida.